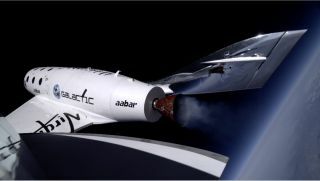 After firing her hybrid rocket motor above Mojave Air & Space Port, SpaceShipTwo coasts up to an altitude of 71,000 feet on a supersonic test flight, Jan. 10, 2014. At 71,000 feet, the sky is already darkening to black, and the curvature of the Earth is evident; a full space mission will go many times higher. As Virgin Galactic prepares to carry paying tourists into space, it's also readying another source of flight cash: carrying tech experiments designed for microgravity. NASA and the private company announced that Virgin will fly 12 technology experiments on the first commercial research flight of SpaceShipTwo, which has undergone several powered test flights in the past year. There will be a mix of experiments from NASA, universities and commercial companies flying aboard, testing concepts ranging from fluid behavior to 3D printer improvements.